The members of MISL have worked with DNA synthesis company Twist Bioscience to preserve a range of artifacts, from iconic recordings of the Montreux Jazz Festival, to the Universal Declaration of Human Rights, to your neighbor’s favorite cat photo. Along the way, they used these projects to practice encoding and decoding snippets of digital data in synthetic DNA and demonstrate new capabilities for random access and content-based search. They even revealed plans to launch a DNA-based archive into space next year as part of Arch Mission’s Lunar Library, a unique challenge that will compel the researchers to find a way to protect their precious cargo in the harshest of environments for the sake of posterity. 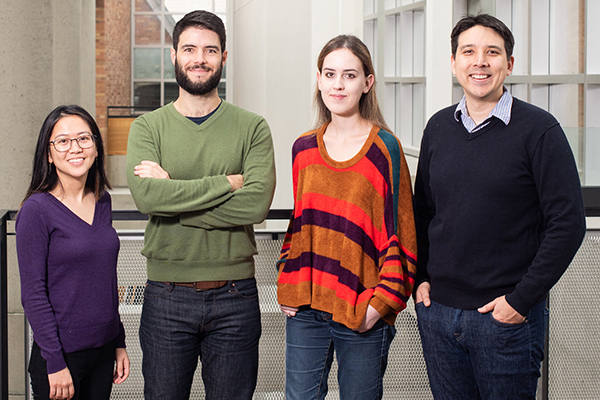 Now the team, co-led by Ceze and Microsoft Principal Researcher Karin Strauss, is ramping up the innovation — and the scientific “wow” factor — with a series of new projects that have opened up exciting new avenues for exploration at the intersection of biology and computer science. One of those projects, described in detail in a new paper published in the journal Nature Communications last week, may be the clearest indicator yet that a DNA-based storage system is not only an intriguing option for solving the world’s data crunch, but also a practical one. In their latest paper, Strauss and her colleagues presented a system for achieving high-density data storage in synthetic DNA. By “high-density” they mean one full terabyte of data — the equivalent of 1,000 gigabytes — in a single spot of dehydrated DNA one millimeter in diameter, or roughly the size of a pinhead. Although the information density of DNA molecules is theoretically much higher than that, the team wanted to ensure the ability to retrieve specific data from a particular pool without having to sequence the entire pool. The team arranged the spots of DNA on glass cartridges, with each cartridge capable of storing up to 50 terabytes based on current DNA storage techniques. Multiple glass cartridges can then be stacked in a space-saving vertical configuration — akin to the approach taken with existing magnetic tape or hard drive-based storage systems to conserve room, albeit much more compact. To retrieve the data, the researchers rehydrate the DNA with a droplet of water using a digital microfluidics (DMF) device. Newman and her colleagues took a keen interest in DMF technology, which is capable of manipulating liquids in very small quantities with higher precision than humans. By automating biological and chemical protocols with DMF, researchers can scale up the processes involved in implementing DNA data storage. The devices are particularly suited to DNA storage processing, but they have their limitations: not only do DMF platforms tend to be prohibitively expensive, but they are also inflexible, error-prone, and difficult to program. Recognizing that DNA data storage would remain a pipe dream as long as the combination of cost and complexity made it inaccessible to all but a handful of experts in resource-rich laboratories, a group of MISL researchers developed a low-cost, general-purpose DMF device for holding and manipulating the droplets of DNA, which they dubbed PurpleDrop, and a full-stack DMF automation platform known as Puddle. 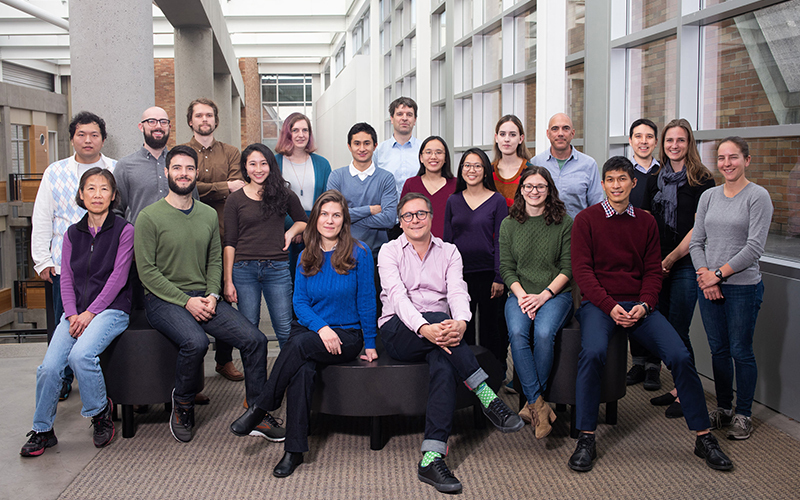 Together, the projects — which the team will present at the Association for Computing Machinery’s 24th International Conference on Architectural Support for Programming Languages and Operating Systems (ASPLOS 2019) this week — comprise a complete DMF programming system that will make microfluidic technology more accessible while simultaneously expanding its computational capabilities. Puddle’s dynamic approach to resource management sets it apart from existing techniques, which take a more static approach to microfluidic programming. Puddle is an application programming interface (API) that purposefully maximizes expressiveness and ease of use, in exchange for sacrificing some efficiency and ahead-of-time guarantees. This trade-off gives Puddle more flexibility, allowing both the system and the user to react to data from the fluidic domain. These data-driven decisions fall into three categories: protocol-level decisions, such as automatic replenishment of a liquid that has evaporated during an experiment; application-level decisions based on the protocol output, such as what experiment to run next; and execution-level decisions, such as error detection and correction. To enable the latter, the team employed computer vision and a small camera mounted on top of the DMF device. The camera functions as a multi-purpose sensor for detecting the location and volume of droplets to help Puddle decide if an error has occurred. 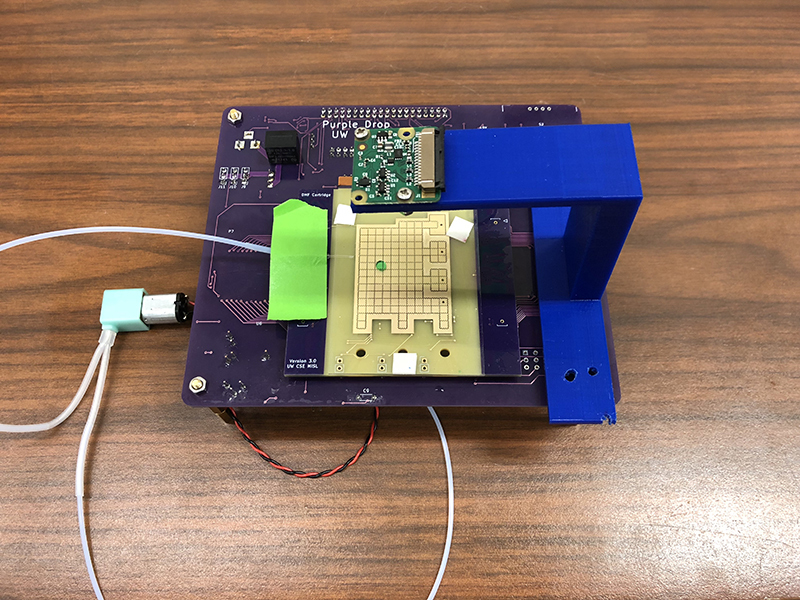 The built-in error detection enables the robust execution of the system on relatively cheap hardware, meaning the researchers could prioritize simplicity and accessibility in designing the PurpleDrop device. In addition to the camera, PurpleDrop features a Raspberry Pi 3B single-board computer, instead of a microcontroller, to drive the electronics, which enables it to function as a self-sufficient microfluidics platform. 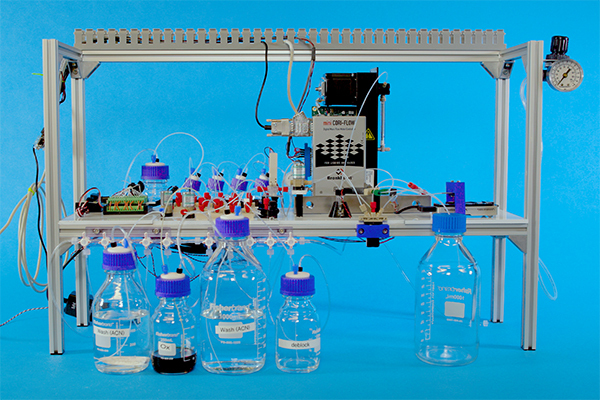 Costing about$300 assembled — orders of magnitude less than most fluidics systems — the design is also simple enough for many labs to put together on their own, without requiring access to a clean room. Because cost and complexity are probably the two biggest barriers to widespread adoption of DNA as a storage medium, it comes as no surprise that automation has emerged as a recurring theme in MISL’s work. Last month, the world said “hello” to the first fully automated, end-to-end system for storing digital data in synthetic DNA. Lab members took those five letters, represented by five bytes of data, and ran them through a fully functioning prototype incorporating the equipment required to encode, synthesize, pool, sequence, and read back the data — the majority of which, like PurpleDrop, was built using inexpensive, off-the-shelf components. And it performed the cycle without human intervention, which as senior research scientist Chris Takahashi pointed out, will be an advantage when it comes to DNA data storage in the wild. Takahashi and his colleagues did not set out to demonstrate speed or even affordability at this stage; rather, they built the machine to show that end-to-end automation was possible. The team’s ultimate goal is to develop a system that resembles any other cloud-based storage service, to which end users would be able to upload their data to a storage center. The difference is, instead of staying in digital form, a customer’s data would be converted to the As, Ts, Cs, and Gs of DNA until it is needed again. 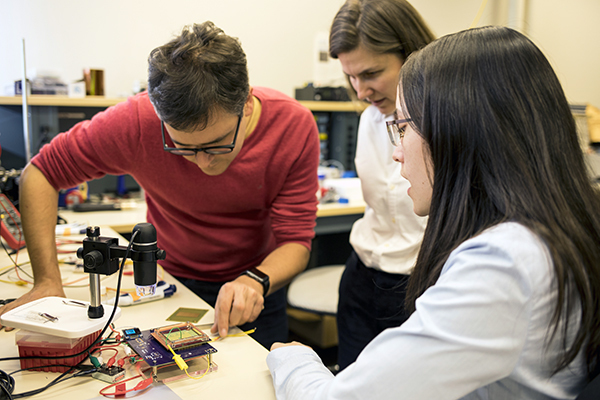 The Nature Communications paper on high-density DNA data storage was co-authored by Newman, Stephenson, Willsey, Takahashi, Strauss, Ceze, and Microsoft researcher Bichlien Nguyen. The ASPLOS paper on Puddle and PurpleDrop was co-authored by Willsey, Stephenson, Takahashi, Nguyen, Newman, Strauss, Ceze, high school intern Pranav Vaid, Allen School master’s students Michal Piszczek and Christine Betts, and Allen School alumnus Sarang Joshi (B.S., ‘18). The Nature Scientific Reports paper on end-to-end automation of DNA data storage was co-authored by Takahashi, Nguyen, Strauss, and Ceze. To learn more about the DNA data storage research, visit the MISL website here.